In 1492 Columbus sailed the ocean blue. I think we all have that line down, but do we know enough about what happened next? Over 500 years ago Christopher Columbus landed in the New World, even though he was sent by the Spanish government to find a faster and more direct route to China and India. Instead he and his crew landed in the Bahamas, and were the first Europeans to set up colonies since the Vikings landed in Newfoundland in the 10th century. Whether you're a fan of Columbus or not, days like Columbus Day are an excellent time to engage children in lessons about exploration and map skills. Egg cartons quickly become the Nina, Pinta, and Santa Maria. Add a little brown paint or marker to the body of the ship. Then place a small ball of modeling clay to the bottom of each vessel. Make some masts out of white card stock paper and hole punch to slide a straw through. Insert the straws in the modeling clay, and you've got an impressive fleet! Columbus was the captain of the Santa Maria, and it was a bit larger of a ship compared to the two others. You could make that ship out of two egg carton sections, to be historically correct of course! We made our map using blue paint and some homemade puffy paint. Have your little one use their fingers to paint a piece of white paper, using their fingers in a wave like pattern across the page. Once your paper is dry it is time to add some land. We decided to make our own puffy paint to make our new world. We followed this simple recipe, comprised of things that were already in our pantry. You want the mixture to be like cake batter consistency. If it's too runny just add a little more flour and corn starch. Once mixed spoon a little onto your paper trying to spread it as you go so it doesn't get too thick. It will spread across the page so be careful not to add too much at a time. Place your paper in the microwave and heat using 25second intervals watching closely, do not overheat. As the puffy paint heats up it will rise, dry and crack. It adds a little relief to a flat map, making it visually a little more interesting. Be sure to label your land masses and add a compass. This is a great activity to introduce a few map skills to your little ones. Talk about directional words and ask your little one to show you (with the ships) how to move in a specific direction. For example Columbus sailed west to find the new world from Spain. 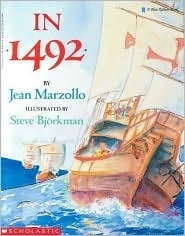 Pick up books like In 1492 by Jean Marzollo to share with children the excitement behind exploration and discovery. Have students get up out of their seats to learn their cardinal directions around your room during a quick game of Simon Says. Work together to draw a map of your school or neighborhood making sure to list north, south, east, and west. Simple ways to get curious young minds exploring the world around them.